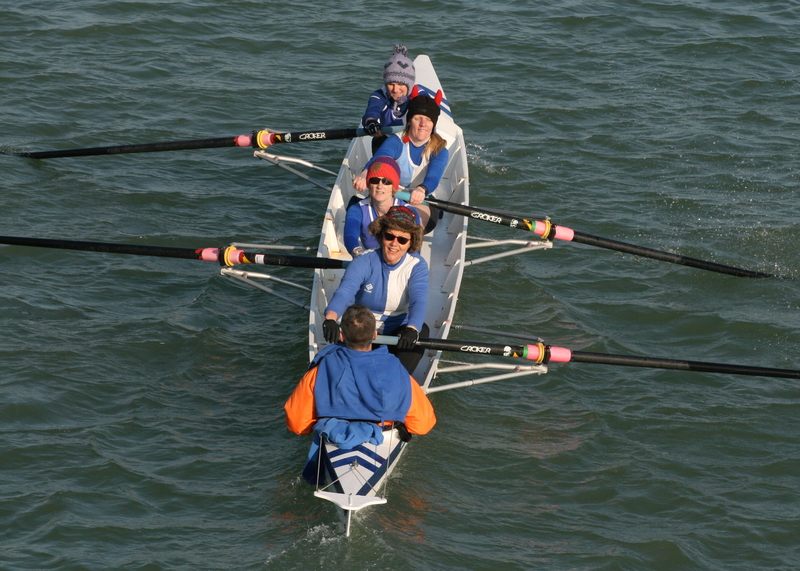 Shoreham’s Adur Head Regatta, the first of the two traditional preseason events for the Coast Amateur Rowing Association (CARA), saw Dover Rowing Club field 6 boats on the 3500 metre course. 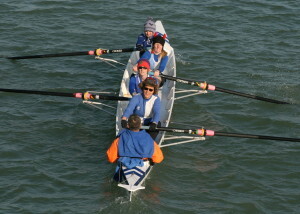 The Men’s Junior 4, Dover Grammar School’s Tom Stothart, Austin Mills, Chris Hall, Cameron Macintosh with Chris Price cox, were the first crew on the water, with three of the rowers competing above their Novice class. The regatta is run as a time trial seeing the crews set off at set time intervals with Dover’s crew chasing Worthing’s 4. By the Norfolk Road Bridge Worthing were well within the Dover’s sights. Just after the footbridge where the course is narrowed by moorings Dover were sat on the rudder of the Worthing boat before launching an attack as the river widened seeing Dover gain a place and valuable time over their opponents. The crew finished in a time of 16 m 18 s finishing a solid 4th place in the event. 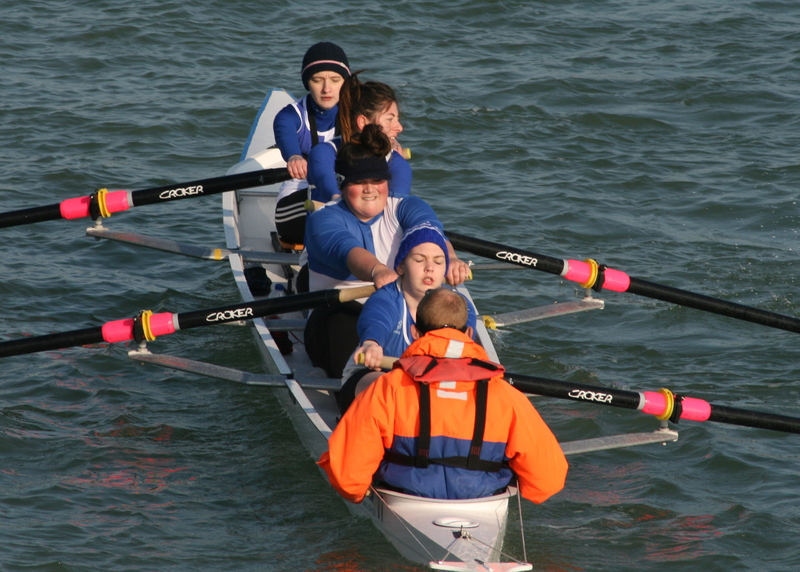 The second block of races saw the remainder of the crews on the water. 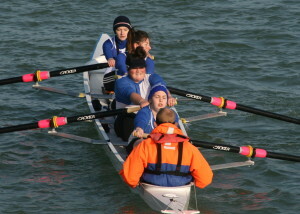 The Junior Sculls matched Price and Hall in their on going battle with the younger Hall starting 3 places behind Price. As the two rowers cleared the Norfolk Road Bridge it was obvious that Price was rowing strongly but that Hall was closing on the two rowers ahead of him. Hall was in the wake of Bexhill rower through the narrows at the moorings and both rowers manoeuvred around a Deal sculler. 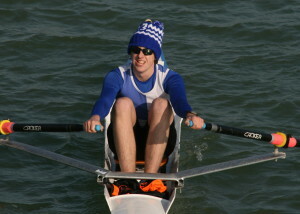 Hall was unable by the end of the course to pass the Bexhill boat or close further to Price as the last straight on the river was affected by a head wind. The results demonstrated that Hall had the better day recording a time 14 m 16 s securing 2nd place and 1st among CARA Rowers in Dover’s fastest time of the day and Price finished 6th with 14 m 39 s. The Ladies Junior 4 of Jen Jordan, Maria West-Burrows, Chrissy Purvis, Lisa Burnett and Paul Scrivener cox were competing together for the first time as a crew in a field containing two strong squads from Bexhill and Shoreham. 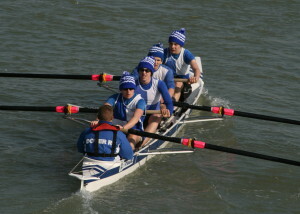 The Ladies Junior 4’s were coming under pressure as they approached the footbridge but were able to hold off the Eastbourne crew who had closed the initial gap leaving the Dover to come in 4th in a good time of 15 m 47 s. The Ladies Novice 4’s race saw Dover field two scratch crews made up largely of Dover’s Christ Church Uni contingent, with Casper Barnsby racing despite only being released from Hospital a few days earlier after a serious illness as she didn’t want to let her friends down. Dover A crew Barnsby, Savannah Bradshaw, Antonia Reed, Amy Lewington with Tony Burrows, cox whilst Dover B’s crew featured Abi Mtde, Anna Gaved, Stephanie Darrall, Emily Harvey with Curly Goodwin cox. The two crews started in slots 77 and 79 with only Shoreham’s boat in between. Once through the Norfolk Road Bridge it was obvious that both Shoreham and Dover B were closing on Dover A and the gap continued to close as they passed under the Foot Bridge with Shoreham passing Dover A to leave Dover B chasing them hard to the finish line. Dover B finished 5th in 17 m 18 s whilst Dover A came in 6th in 17 m 46 s with both Uni crews beating the only other Uni team from Chicester who came 7th.